I never thought that one day I would also make soft stuffed buns at home which we used to buy only from bakery during my childhood days. Thanks to Raks. 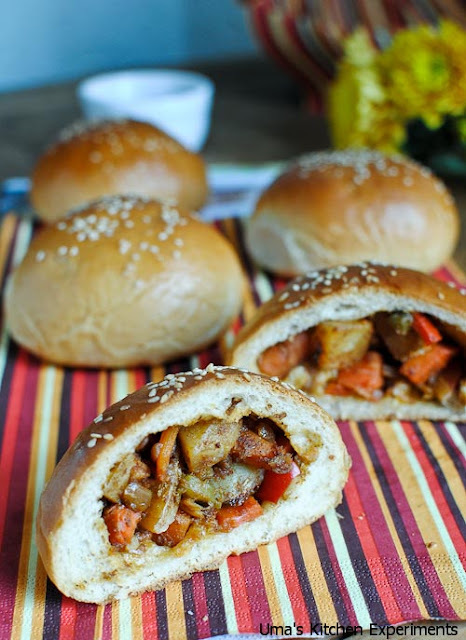 Without your recipe, I would have not thought about trying this stuffed bun. I inspired by your recipe and tried a very slightly changed version as per my family's taste. The outcome... wow..it was awesome. 1) In a kadai/pan heat oil. Add chopped garlic, ginger and onion. Fry till they are soft. 2) Add mixed vegetable of your choice and sprinkle little water. Cover and cook for few minutes till the vegetables are cooked. 3) Once the vegetables are cooked, add chat masala, amchoor powder, salt, red chilli powder and coriander powder. Mix well. 4) Cook for another few minutes or till the raw smell of masala goes off. 5) The vegetable stuffing is ready and allow it to cool for sometime. 1) Microwave or heat the 1/2 cup of milk to lukewarm temperature. Add sugar and yeast and mix well till both dissolve well. Keep aside for 7 minutes to 10 minutes for proofing. 2) In a wide mixing bowl, take the flour and pour the proved milk yeast sugar mixture. Add a tablespoon of olive oil and salt to taste. Start mixing it using your hand and make a soft dough. Add more warm milk if required. 3) Knead it for 10-15 minutes. After 15 minutes, apply olive oil coating and keep in the mixing bowl. Cover it using a cling wrap or cloth. Keep this bowl at warm place till it doubles or for an hour. 4) Meanwhile prepare the stuffing as described above and divide the stuffing into 6 equal parts as per the count of dough balls. 5) After an hour, you can see the dough has doubled in its size. 6) Punch it back and slightly knead it again with the help of oil. 7) Divide the dough into 6 equal parts and roll into balls. 8) Line the baking tray with baking sheet. 9) Take a 1 dough ball and roll into a small disc. 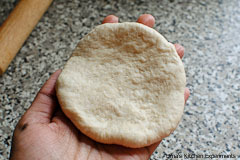 10) Place stuffing in the centre of dough disc and bring the edges to seal. 11) Place this bun in the baking tray. Repeat this step for other dough balls. 12) Cover using a cling wrap and keep aside for 30-45 minutes for the second rise. 13) Preheat the oven to 190C(375F). 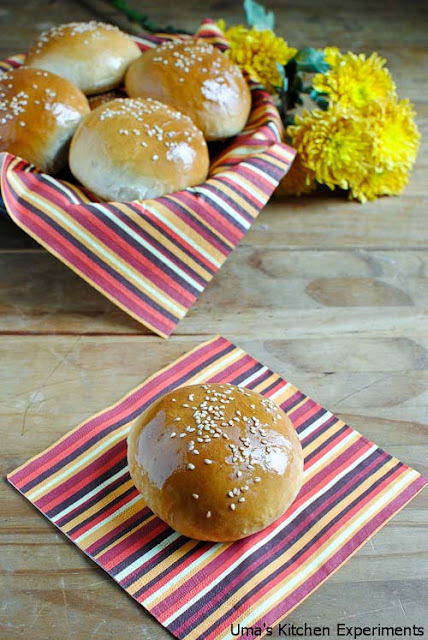 14) After the second rise of the buns, brush the buns with milk/olive oil and sprinkle the sesame seeds. 15) Bake it for 15-20 minutes or till the buns turns golden brown in colour. 16) Apply a coating of olive oil/butter over buns and serve warm. 1) Stuffing is based on your choice. It can be a meat/chicken/paneer/tofu or it can any of your favourite vegetables. 2) Make sure the dough in very soft and NOT hard to make soft buns. Buns look inviting Uma and nice clicks too. 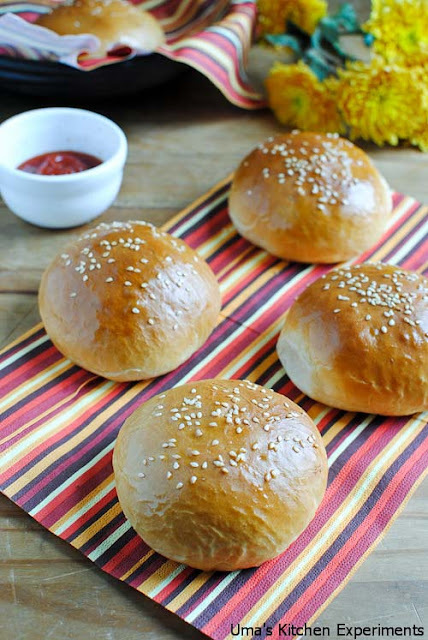 Delicious and perfect buns. I love the filling. These are 100 % bakery stuff.. love it.. Bookmarked..
Well done Uma, i dont mind to have one rite now..
Uma lovely buns and superb clicks. So lovely , Perfect Click.Love this recipe . The last click looks too tempting...Remember eating these buns from bakeries. The buns have turned out perfect. Thanks for the step by step presentation. Tempting n perfect like store brought ones,Uma! !Soft n delicious ones! Delicious stuffed bun,looks so soft and tempting...stuffed buns are my fav. Wow I feel like grabbing one and eating it now!!! Nice idea!!! I dont know how I missed to comment in this post :) thanks for trying and yours looks so soft and fluffy! 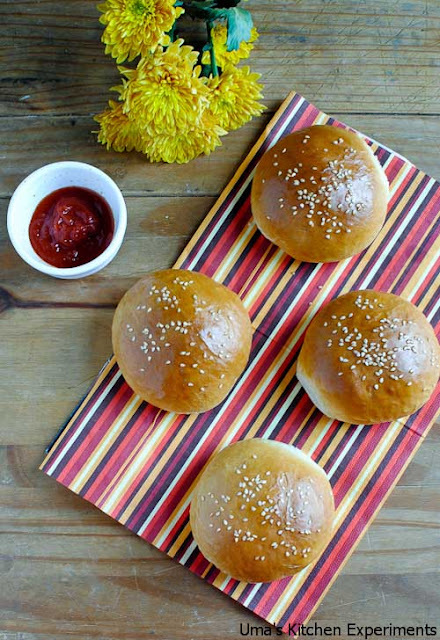 I tried this but my the dough didnt rise but the buns were soft and spongy. I used Instant rise yeast. what could have went wrong?? The dough didnt rise as shown here though the buns were soft and nice. I used instant rise yeast. What could have gone wrong?? Usually if you use Instant Rise yeast, it should be very active and make the dough to rise in shorter period of time. However, if you use instant rise yeast when the recipe calls for active dry yeast, the rise will be slightly less. other than this, Did u check the expiry date of the Yeast? also, instant rise yeast doesn't require proofing and you can directly add it to the dough. Did you keep the dough in warm place for raising? Did you stuff correct quantity(Not over stuffing) of vegetables inside the bun? The perfect kneaded dough should spring back when you touch towards inside. Not following either of these two reasons might have resulted in flat shape. guess oven temperature is not uniform in this case for uneven browning. I baked it with the option of top and bottom heating. Hope I cleared your doubts. Before first raise, the dough should be ELASTIC and PLIABLE. After first raise(if the dough didn't raise properly in an hour, u can also keep it for longtime), when u punch it, it stays as it is. then, you need to knead it for 10-20 minutes till the dough springs back when u touch it.